Do you like the program cover for this year’s Cliburn? I get these books each time, and over the two weeks or so of the competition, they become my travel guide, my constant companion, my best friend, my father confessor, my source of light inside a cold, dark, uncomprehending universe. Their covers usually fade because I handle them so much, but maybe not this year. That’s because they’re printed on a heavy paper that feels like velvet to the touch. I wish all my office documents could be printed on this paper. I’d be 2.4% happier as a person. The program used to have contestants’ social media information included with their bios, but that was eight years ago, so long that they listed MySpace pages. 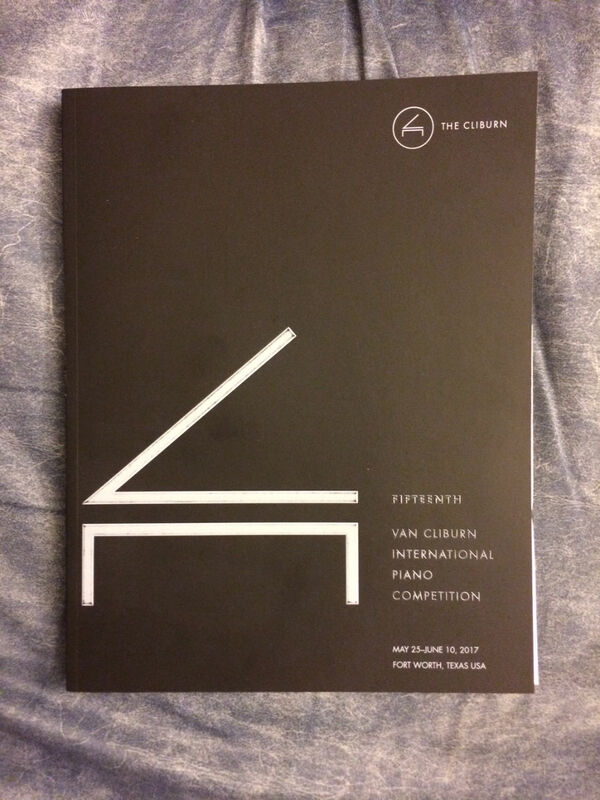 The program no longer has this, but you can find it on the Cliburn website, or click on the hyperlinks here in these preliminary-round posts. One other note: The program also includes a welcome from Gov. Greg Abbott, who wants to shoot me. Well, that figures. Like his compatriot Leonardo Pierdomenico, Luigi Carroccia also comes in toting a neoclassical alternative to Mozart and Haydn. He’s playing Giovanni Sgambati’s transcription of the “Mélodie” from Gluck’s Orfeo et Euridice, and it’s a good choice, letting Carroccia achieve a piercing pathos. The pianist is mopping his forehead before he even starts playing. It must be hot under those stage lights, because it’s cold enough in the hall that when I step outside, my glasses fog up. Carroccia does better with Chopin’s Polonaise-Fantaisie than Fukami did, keeping together a piece that can easily fall apart and investing the thing with superb coloration. He overpedals Scriabin’s Third Piano Sonata but still captures the work’s fiery spirit. I want to hear more from this guy. Nikolay Khozyainov was at this competition four years ago, and if he were a baseball pitcher, you’d say he has filthy stuff. His Haydn Sonata in D major is open and sunny, and the arpeggios in Chopin’s Étude in C major (Op. 10, No. 1) are shaken from his right wrist like magic. Even more impressive is his Rachmaninov Étude-tableau in C minor (Op. 39, No. 1), a stormy piece with torrents of notes that he tosses off with such ease that it scares me a little. Unfortunately, he can’t keep from meandering off track in Liszt’s Après une lecture de Dante, nor can he recover his footing in the Hamelin toccata. Yes, he has filthy stuff, but he loses command in the sixth inning and has to be lifted for a reliever with two men on base and a two-run lead. I’ve now stretched this metaphor beyond the breaking point, stomped on it, and left it lying in pieces on the floor. Another returning competitor is Nikita Abrosimov, who made it to the Cliburn semifinals in 2013, but is a late addition to this year’s contest after Algerian-Canadian pianist Mehdi Ghazi dropped out. Abrosimov’s Variations on a Theme by Corelli remains stubbornly unexciting, and he dithers his way through the Hamelin toccata. He only catches fire with his last item, Stravinsky’s Trois Mouvements de Petrouchka, and he has trouble maintaining his focus through that. He does take the piece’s incredibly hard passages without any trouble, but we’ll see if that’s enough to get him through. A sidebar: When Ghazi announced he wouldn’t be competing last month, I wondered why. At first, I thought it might be that Muslim-hating imbecile in the White House. (I know, I know: Which one?) Today, though, a simpler reason occurred to me: Yesterday was the start of Ramadan. An observant Muslim is supposed to abstain from food and drink from sunup to sundown, not even being allowed a glass of water. I covered this topic three years ago when the World Cup soccer tournament was held during the holy month. Some of those World Cup players used an exemption from the fast that’s available to travelers. Then again, another Muslim might feel the fast is too important, while feeling unjustified about taking someone’s spot when he knows he won’t be playing his best. Even so, Ghazi’s absence is a pity for so many reasons: because Ramadan wouldn’t have been an issue in another year (it shifts around the calendar), because Ghazi is 27 and won’t get another chance to compete, because we won’t see Algeria’s crescent-and-star flag hanging from Bass Hall’s mezzanine, and because Ghazi’s musical training was interrupted by religious fanatics who shut down the schools, so his presence would have stuck it to the fundamentalists in his country, not to mention some fundamentalists in ours. If you want to see what he’s capable of, here’s a link to Ghazi playing Brahms. I hope the Cliburn invites Ghazi to perform here in some capacity. In the meantime, I wish Ramadan mubarak to him and the rest of you. Back to the music: The third straight Russian competitor is Georgy Tchaidze, a native of St. Petersburg despite his Georgian name. His recital bores me intensely. His playing is insipid through Scarlatti’s Sonata in D minor (K. 77), Beethoven’s 31st Piano Sonata, Hamelin’s toccata, and even Rachmaninov’s Étude-tableau in C minor (Op. 33, No. 3), which comes out downright soporific. He does find his groove before the end and turn in a decent version of Rachmaninov’s Étude-tableau in C-sharp minor (Op. 33, No. 9), but from where I sit, it’s too little and too late. Better stuff comes from Minnesota’s Kenneth Broberg, who, thanks to the vagaries of the draw, is playing a program made up entirely of pieces that have already been played in the last two days. The same words come to my mind about his performance of all of them: clean, alert, well-judged. He plays the same Franck-Bauer Prelude, Fugue, and Variations that Maximov played, but without the Russian influence and with an austerity and directness that seems truer to Franck’s spirit. The piece lacks a little bit of direction, as does his rendition of Hamelin’s toccata, but that can’t be said for his unwinding of Bach’s Toccata in C minor, which is less colorful but more incisive than Bartlett’s performance of it. You can argue as to which is better, but Broberg’s performance of Barber’s Piano Sonata is undoubtedly superior to Bartlett’s, blessedly free of the bombast and blurred lines that we heard from the English kid yesterday. Broberg hasn’t shown much in the way of blood and thunder, but his safety-first approach is good enough for now. Park Sun-a was born in Busan, but she grew up in New Jersey, so that makes her the third American to take the stage here. (She conforms to Western practice regarding her name and goes by Sun-a Park, but I’m imposing a standard and putting Chinese and Korean surnames before the given names. I’m hoping this reduces confusion.) If Broberg’s Bach is pianistic, Park’s is orchestral, as she does up his Capriccio in B-flat major with a wide range of sonorities that make it immensely pleasurable to hear. She turns tentative with the Hamelin toccata, but returns to form with Schumann’s Humoreske. If that title puts you in mind of a light little diversion, the actual work is a lengthy one that takes about half an hour to play. Park does yeoman work just to hold the seven sections of this piece together, and her rendering is intelligent and scrupulous. Hong Kong technically belongs to China, but its athletes and sports teams still compete separately from the mother country’s, and apparently so does its pianists. Rachel Cheung flies the flag of Hong Kong, which you seldom see outside the territory. She comes out in an eye-catching red dress and plays Schubert’s Drei Klavierstücke in quite an attractive manner. (If you can’t pronounce the German title, just say “three piano pieces,” because that’s what it means.) She continues a strong run with two Debussy preludes, Ce qu’a vu le vent d’ouest (“What the west wind saw”) and Voiles, which is a French homophone that can mean “Veils” or “Sails.” Her choice of the Mephisto Waltz is a bit eccentric for her, since she doesn’t seem to have the wildness that gives the virtuoso exercise its personality. She still makes good work out of the piece’s silvery runs and lyrical middle section, and turns in a fine, understated performance of Hamelin’s toccata. Seoul native Lee Eun-ae strides to the piano wearing a red dress quite similar to Cheung’s, so I guess we’ll have to call in Us magazine to decide who wore it best. Her playing is gorgeous through Haydn’s Sonata in B-flat major (Hob. XVI:41) and Debussy’s Étude pour les arpèges composés. This is also true for Chopin’s Third Piano Sonata, but I have an issue here. Yes, the work is meant to be beautiful, but it’s also meant to be a tragic masterpiece, and I’ve heard other pianists play it with more urgency and drive. Lee is predictably great in the sonata’s second movement, but something’s missing. She uses the score in the Hamelin toccata, though she doesn’t use a page turner, perhaps because she never turns the page. Maybe she just needed help with one section of the piece? Anyway, her performance of it isn’t up to the standard of the rest of her program. Ending the evening is Russia’s Sergey Belyavskiy, who has his own YouTube channel, where he goes by the handle “Lastpianist.” Wonder what the story is there? Maybe that YouTube channel is what got him his own cheering section, which turns up in Bass Hall. He starts assertively with Schubert’s “Wanderer” Fantasy but loses steam midway through. He plays Sergei Taneyev’s Prelude and Fugue in G-sharp minor, and I’ll admit I’ve never heard any of Taneyev’s music before today, even though he was Tchaikovsky’s student and Rachmaninov’s teacher. The prelude of the piece does little to convince me that he isn’t just some late-Romantic historical curiosity, but the fugue gets me somewhat intrigued, as it features a left-hand part that requires every bit as much dexterity as the right. Belyavskiy handles it effortlessly, but I don’t like his choice of Liszt’s Second Hungarian Rhapsody as his ending. Not only does he fail to escape the shadow of Bugs Bunny, but he runs through it like he’s racing the clock, and what’s the point of playing any of the Hungarian Rhapsodies if you’re not having fun? I can’t tell whether he was having fun, but I didn’t have much. Tomorrow we have an abbreviated day and the announcement of the quarterfinalists. I’ll see you back here.